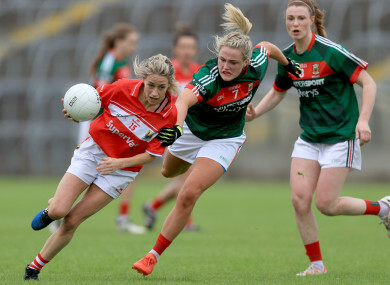 Cork and Mayo go head-to-head in the Division 1 semi-final. THERE’S A BIG Sunday of ladies football ahead with the Lidl Ladies National Football League semi-finals down for decision. 2017 All-Ireland champions Dublin face Galway — the only team to beat them in the Division 1 campaign so far — as their quest for a first-ever top-flight crown continues. 12 of the team that started last September’s decider in Croke Park do so again for Mick Bohan’s outfit while Tracey Leonard will lead the Tribeswomen charge from centre forward. Kinnegad plays host to the Dublin-Galway clash at 3pm with Tipperary and Armagh going head-to-head in the curtain raiser — a Division 2 semi-final. Elsewhere in the top flight, six in-a-row chasing Cork and 2017 All-Ireland finalists Mayo do battle for a coveted final spot at St Brendan’s Park, Birr (throw-in 3pm). It’s shaping up to be a mouth-watering affair, and a repeat of last year’s All-Ireland semi-final which saw Mayo inflict a first All-Ireland series defeat to the Rebels since 2010. There was just a point in it that day while Cork came out on top by the same margin in their group stage meeting of this year’s league. Waterford and Cavan face off in the preceding Division 2 semi-final in Birr. In Division 3, it’s Wexford v Kildare and Meath v Down vying for the two decider spots while Wicklow and Antrim, and Louth and Limerick make up the last four pairings in the fourth division. Division 3: Meath v Down — Inniskeen Grattans, Monaghan, 1pm. Division 4: Wicklow v Antrim, Inniskeen Grattans, Monaghan, 3pm. Wexford v Kildare – Stradbally GAA, Laois, 2pm. Louth v Limerick, McCann Park, Portarlington, Laois, 2pm. Email “Cork v Mayo, Dublin v Galway - Last four name sides for huge day of league action”. Feedback on “Cork v Mayo, Dublin v Galway - Last four name sides for huge day of league action”.